Another new plant has joined the garden. This time it is a hardy begonia. 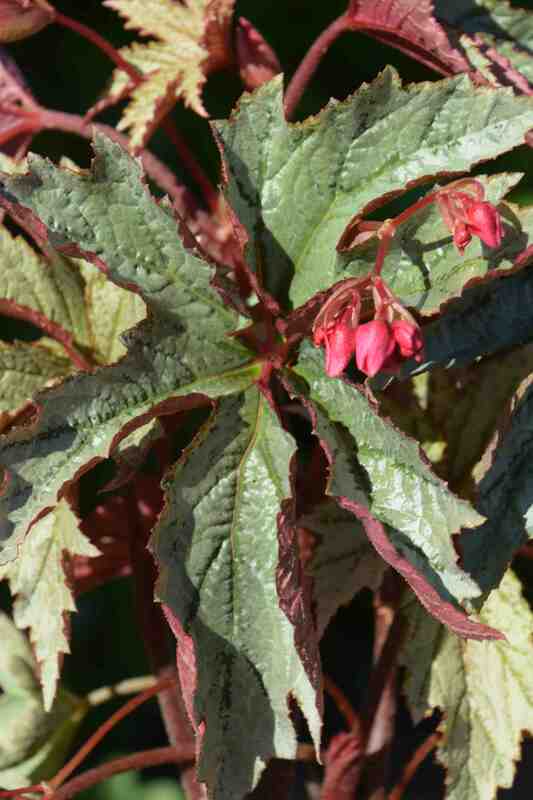 For many years I have grown the commonly known hardy begonia: B. grandis ssp. evansiana. This is an interesting plant but with its tall stems of mid green, rather ‘ordinary’ leaves, admittedly flushed with red, and small pink flowers in autumn it is not among the most showy of plants. It is for the sheer novelty of being hardy that we grow it. I am being a bit hard on the plant because it is a nice looking thing but it comes into growth rather late in summer and it makes lots of bulbils on the stems that drop to the ground to form dense clumps of plantlets. Nevertheless I would not begrudge it a place in the garden where it will thrive in sun or part shade in well drained soil – wet, especially in winter, along with vine weevil and an extraordinarily cold winter are the plant’s worst enemies. 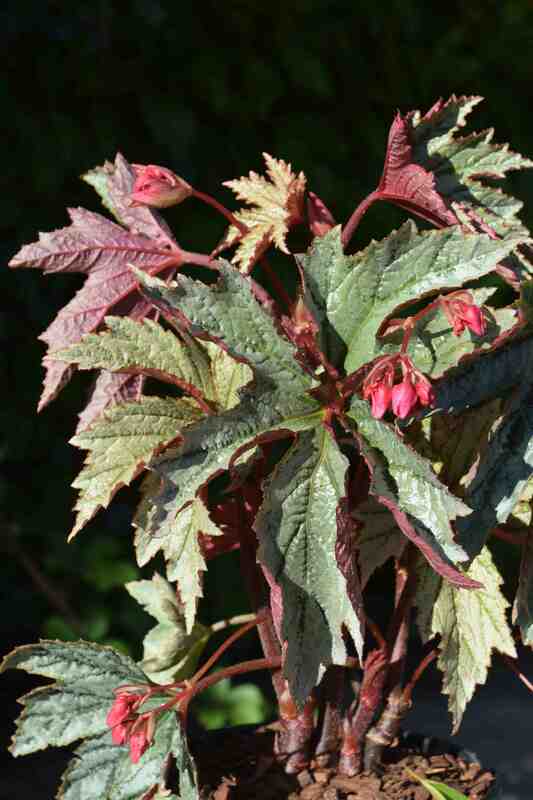 But this is not the only hardy begonia and a few dedicated souls have collected cold-tolerant species or combined them to give us more options. Terra Nova nurseries in Oregon, the people (well Dan Heims and his staff) have been busy with begonia flowers as well as heucheras and have produced a range of cold tolerant begonias although I am not sure that the newest are being sold as totally hardy. But ‘Silver Splendor’ is (or was, since they no longer list it) is reputedly hardy, though the exact amount of cold it will take before it dies seems to be unclear. It should certainly take the -6c that is usually regarded as defining a plant as hardy. ‘Silver Splendor’ is a cross between B. hemsleyana which has divided, spotted leaves with the pollen of B. taliensis with large, jagged leaves and pale pink flowers. Both are Chinese. The new hybrid is more colourful than either parents and will grow to about 40cm high and wide with deep pink flowers. It looks too exotic to be hardy and I am keeping this in a pot for now. It will be planted in a bigger pot and put on the patio so I can pull it towards the house for winter once frost has killed the top and I can keep it drier for winter. If I was planting it in the garden I would plant it a bit deeper and give it a mulch to protect the rootstock from cold. Time will tell if it really is hardy but even if it continues to look good all summer I will be impressed. Of course this plant has merit on its own as a specimen but, if it proves hardy I think it would be good with ferns and hostas and less colourful woodland plants. I think it has a lot of potential to add colour to a woodland planting which tend to look well past their best in autumn. I was writing this and wondering why the label on the plant has it as ‘Silver Splendour’ bearing in mind that this was raised in America and checked and of course it should be ‘Silver Splendor’ so I changed the title to the ‘proper’ spelling. Don’t get me started on the right or wrong spelling! Interesting plant, hope it survives.